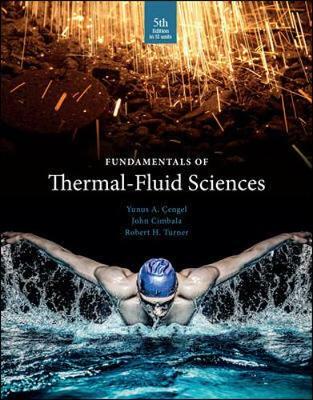 THE FIFTH EDITION IN SI UNITS of Fundamentals of Thermal-Fluid Sciences presents a balanced coverage of thermodynamics, fluid mechanics, and heat transfer packaged in a manner suitable for use in introductory thermal sciences courses. By emphasizing the physics and underlying physical phenomena involved, the text gives students practical examples that allow development of an understanding of the theoretical underpinnings of thermal sciences. A special effort is made to help students develop an intuitive feel for underlying physical mechanisms of natural phenomena and to gain a mastery of solving practical problems that an engineer is likely to face in the real world. The objective of this text is to cover the basic principles of thermodynamics, fluid mechanics, and heat transfer. Diverse real-world engineering examples are presented to give students a feel for how thermal-fluid sciences are applied in engineering practice. By emphasizing the physics and physical arguments, students are able to develop intuitive understanding of thermal-fluid sciences. This edition contains sufficient material to give instructors flexibility and to accommodate their preferences on the right blend of thermodynamics, fluid mechanics, and heat transfer for their students. By careful selection of topics, an instructor can spend one-third, one-half, or two-thirds of the course on thermodynamics and the rest on selected topics of fluid mechanics and heat transfer.